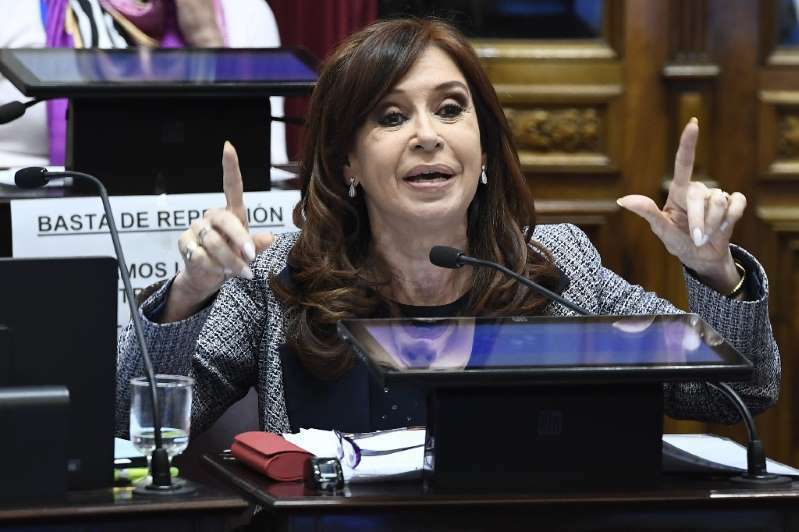 Ex-Argentina president Cristina Kirchner was charged with corruption as a judge asked that her parliamentary immunity be lifted so she can be detained, reports said Monday. She is accused of having accepted tens of millions of dollars in bribes in the notorious "corruption notebooks" scandal that has rocked Argentina's political and business elites. As a senator, Kirchner is protected by parliamentary immunity from imprisonment, although not from prosecution. Unless that immunity is lifted, she cannot be jailed, even if found guilty. However, last month the Senate did vote to partially lift her immunity so that investigators could search her three luxury homes. She has has already been called in for questioning twice by Claudio Bonadio, the judge leading the wide-ranging corruption investigation, and is due to appear again on Tuesday. Kirchner is accused of heading an "illicit association." During her first two hearings she refused to answer Bonadio's questions, instead submitting a written statement, as is her right. Both Kirchner, 65, and her late husband, Nestor, whom she succeeded as president in 2007, are suspected of having accepted millions of dollars in bribes from businessmen in exchange for public works contracts. More than a dozen former government officials and 30 elite businessman are implicated in the case first reported by La Nacion newspaper on August 1, claiming that bribes were delivered by a ministerial chauffeur to the Kirchners' residences over a 10-year period. Prosecutor Carlos Stornelli has said a total of $160 million in bribes was handed over between 2005 and 2015. At her last court appearance, Kirchner stressed her "categorical and strict denial" that she "committed any crime" or was involved in "any illicit activity." Also facing trial in several other corruption cases, she has previously accused Bonadio of carrying out "judicial persecutions" aimed at derailing a possible presidential run next year.